JBL Everest 300 review | What Hi-Fi? Here at What Hi-Fi? we appreciate good sound quality, and understand the best way to get it on a restricted budget is to keep the tech involved simple. Wireless ability can sometimes be the enemy of good sound, but the need to cut the ties is only getting more important. The JBL Everest 300s are among the cheaper wireless headphones options. They are made up of highs and lows - which balance each other out somewhat. The JBL Everest 300s are roughly made in the Beats mould. Their lines are chunky, with a youth/street inflection. They look good enough, but put them on your head and they stick out quite a way at each side. The cups sit on swivelling bases, making each earpiece an inch or two deeper than those of the Beats Solo 3 Wireless. It’s not a look everyone will like, but it has its benefits. The cups rotate a few degrees in every direction, so they will fit any head without too much fiddling around. A solid fit and deep fake leather-topped padding makes attaining a perfect seal easy, and passive isolation is among the best we've experienced in a pair of on-ear headphones. They handle public transport with ease. 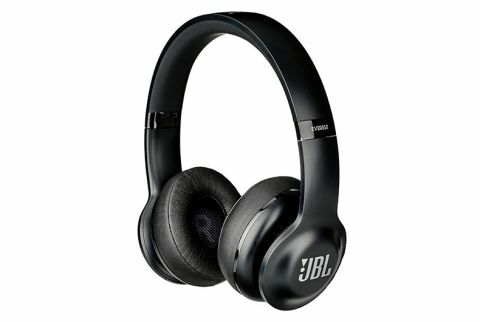 Like any on-ear headphone with a strong amount of clamping force, the JBL Everest 300s will start to cause some ear discomfort after a while - especially if you wear glasses. But the thick padding still makes them a more luxurious fit than the rival Beats Solo 3 Wirelesses. Aside from the band of metal in the middle of the headband, the JBL Everest 300s are all-plastic. From a distance, the finish on the back of the cups looks like anodised aluminium – you could probably trick your friends into thinking you spent significantly more on them. Like Beats’ headphones, the JBL Everest 300s use a rubbery substance for the headband padding, which increases friction and gives better grip. However, the weight distribution of those sticking-out cups means head-waggling will make them gradually fall off your head – not good for listening to music during vigorous exercise. They do fold up, though, and have all the controls you need on the cups. There’s a rocker on the back of each one. The left cup handles volume and playback, the right has a power button and a share button. Press this and you can connect another Bluetooth headphone, to share music with a friend. Wireless reliability is solid, as is the battery life of 20 hours. However, lag is too significant to make the JBL Everest 300s suitable for video streaming. You can update the firmware using a PC app, but it’s available for Windows machines only. The JBL Everest 300s have an unusually expansive soundstage, closer to that of a full-size headphone rather than an on-ear design. There’s a sense of real vertical space as well as width, meaning the JBL Everest 300s create immersive soundscapes that would be notworthy at the price even if these weren't wireless. Added to the great isolation, this expansive presentation lets you lose yourself in these headphones’ sound. Bass is solid too. It’s fairly deep and has real punch, but is less intrusive than the low end of the Beats Solo 3 Wirelesses. It doesn’t boom, resonate significantly or step on the other registers. Already we have some pleasing sonic characteristics for a £110 pair of wireless headphones. But they aren’t perfect - the higher frequencies, for instance, are less adept. The JBL Everest 300s’ mids are soft and lack definition, and the treble is tame. There just isn’t that zing you might be looking for and dynamics aren’t particularly expressive. The JBL Everest 300s aren’t perfect headphones, but they are decent performers considering the price. Bluetooth is reliable, if laggy, and while the sound lacks some mid-range and treble definition, its large soundstage and energetic bass ensures some appeal.